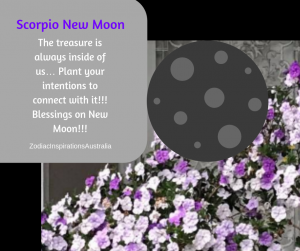 Scorpio New Moon🌑 ♏to heal a wound! The ruler of this New Moon is Pluto and the co-ruler is Mars as per the evolutionary astrology. Both are having a good conversation with other planets in the sky. Pluto smiling to the New Moon brings an opportunity but we need to make the connection to be able to heal a wound. We need to explore deeply into our own psyche – see through the darkness to feel the light.